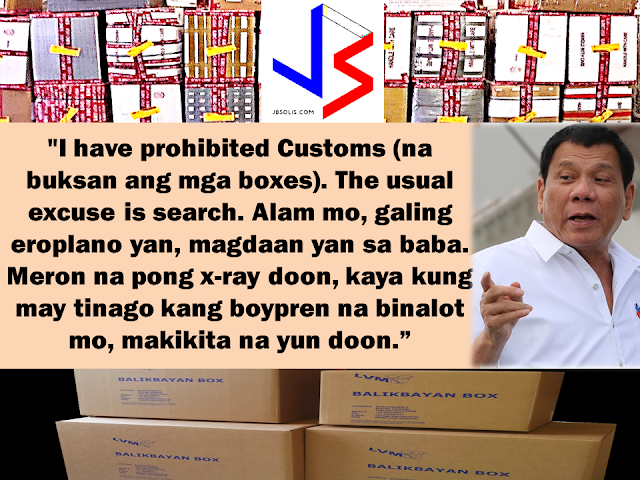 President Rodrigo Duterte prohibited the Bureau of Custom from opening the OFWs Balikbayan boxes in an address to around a thousand Overseas Filipinos in Thailand during his last leg of ASEAN visit. He also assured OFW's that their balikbayan boxes will be safe through the Bureau of Customs especially during Christmas season. Balikbayan boxes are the traditional packages or and gift boxes sent by Overseas Filipino Workers to their love ones and relatives in the Philippines. Duterte also mentioned that many politicians get special privileges at the airport which are not accorded to ordinary people. He said, politicians usually get salute at the airport while the poor gets their stuff taken from them during the inspection. The Bureau of Customs (BOC) was also accused of unnecessarily opening up balikbayan boxes during inspection to check for smuggled goods. Upon delivery, many families and relatives complains missing items from their rummage. Duterte said, it is already a custom among Filipinos who work overseas to bring gifts or "pasalubong" for their relatives. He advised to inform the officer that those are all gifts, from the hard-earned money. 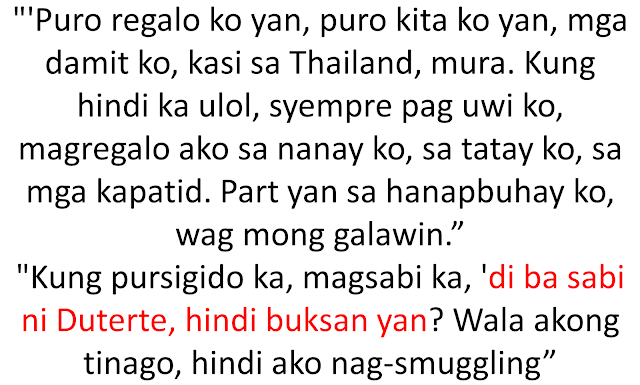 He joked, that it is natural that during the homecoming or vacation of the OFW there would be gifts for almost everyone in the family and there are 20 more luggages to follow. He even told OFWs to be assertive of their rights, even giving them permission to drop his name. 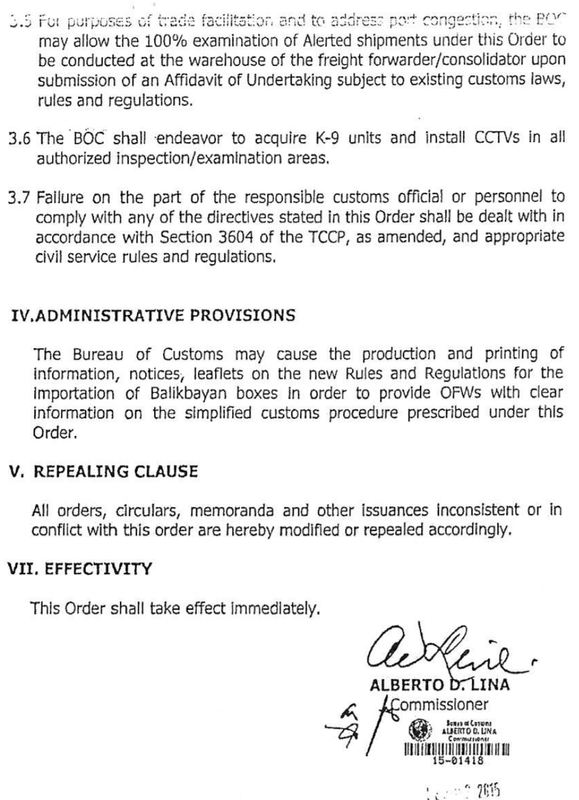 On the other hand, Commissioner Nicanor Faeldon of the Bureau of Customs reiterates Memorandum no, 2016-11-016 regarding handling of Balikbayan Boxes. 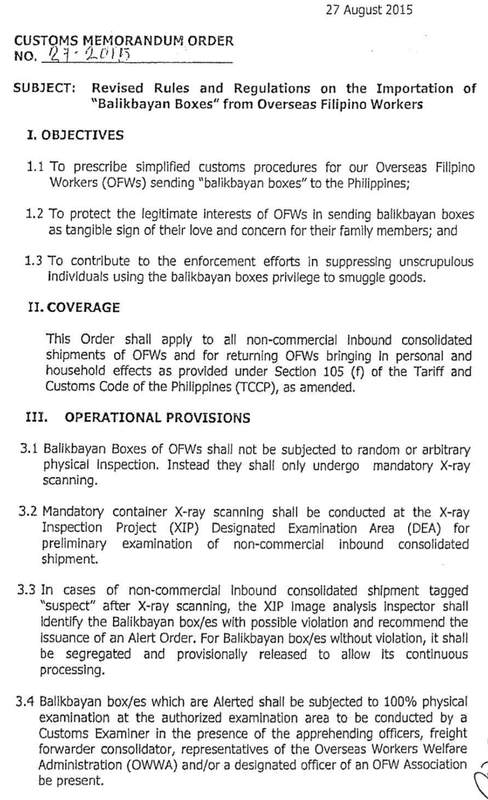 With the growing number of illegal acts taking advantage of the privilege given to the OFWs balikbayan boxes apprehended by the Bureau of Customs, the bureau has to do something to prevent these people to continue exploiting balikbayan boxes for the benefit of their illegal operations. 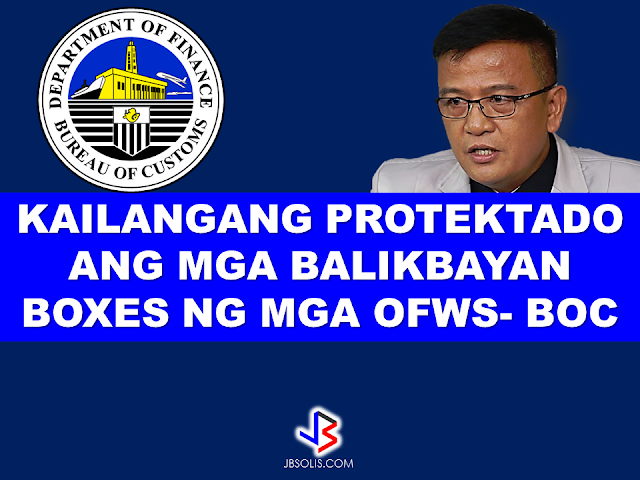 Bureau of Customs Commissioner Nicanor Faeldon says the agency's working on a system to prevent OFW names from being hacked and used without their knowledge--and Balikbayan Boxes from being used to smuggle contrabands. In an interview with Bloomberg Philippines, Commissioner Faeldon discussed the measures they are taking to keep the balikbayan boxes and the OFWs protected. Started last Christmas (2016), they can send balikbayan boxes home tax-free for up to three (3) times a year. The total value of all three balikbayan boxes should not be more than ₱150,000 and the number of items in the packages should just be suited for personal use and not in commercial quantities.